New Hope Art League - Times Publishing Newspapers, Inc. Founded in 1974, the New Hope Art League (NHAL) is a welcoming group of area artists interested in making art, learning more about many facets of the art world and getting their art out to a broader audience. Be inspired. Meet other artists and art lovers. Learn new techniques and ideas. Join NHAL for their monthly meetings, which are free and open to the public! They meet on the last Tuesday of the month (September-May), 7:00-9:00pm, at St. Martin of Tours Church School, 1 Riverstone Circle, New Hope, PA (Route 179/W. Bridge Street/near Staples). *Tuesday, April 30th – 7:00-9:00pm, Dan Tarradellas – Photography/encaustic wax medium demo. Follow their Facebook page “New Hope Art League” for up-to-date news about meetings and events. Visit www.newhopeartleague.com for more information. 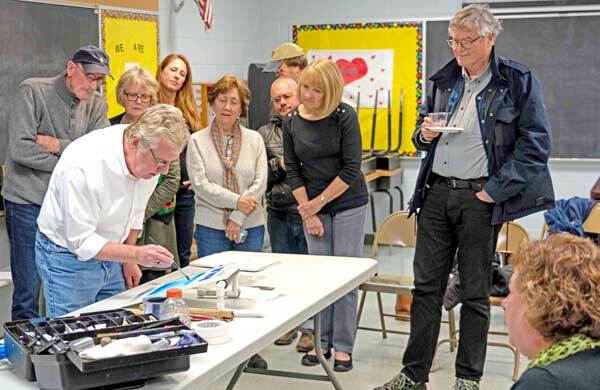 PHOTO CAP: Watercolor artist James Toogood presented a wonderful demo at one of last year’s Art League meetings. Photo by Donna Lovely.